We are very happy with how this year is wrapping up and look forward to a coming one of renewed partnerships and more opportunities for Syrian children and youth. We are also happy to share with you our 2015 annual report, where you can learn about the impact we have all achieved together last year. We hope you will enjoy reading through it. Let us know if you have any questions at info@jusoorsyria.com. The INEE Standards and Practice Working Group includes 30 NGOs, UN agencies, and academics from around the world that work together to facilitate access to quality education for all in emergencies and post-crisis recovery. Through this group, Jusoor works with other actors, including Save the Children, the International Rescue Committee, the Norwegian Refugee Council, and UNRWA, leading the mobilization of education in emergencies knowledge and developing innovative strategies to professionalize and improve capacities within this field. Jusoor joined in 2015 for the 2015-2017 cycle. In the last meeting in Berlin, we were selected as one of few NGOs that will work in the area of training trainers. This builds on our previous work in teacher-training at our 3 educational centers and at other schools in Lebanon. We are grateful for our partners and supporters in this area, including IDRF-YPC, the Varkey Foundation, Right to Play, CARE, and the Said Foundation. Nawara Alaboud on a 3-year one, where they will study the American curriculum in an international environment. Selection of students took place in partnership with UWC Syria, which sends Syrian students to study the International Baccalaureate at UWC schools around the world. The picture on the right is from Khaled’s first hike with his classmates in the Himalayas for activity week. “It has been very busy here, and education is very different from that in Syria. The experience has been extraordinary,” says Khaled. 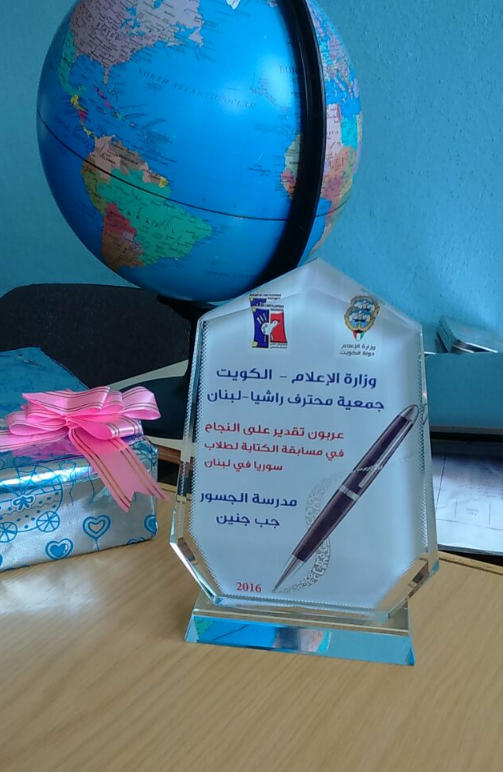 Kawthar Sawwan, 10 years, won the first place in the writing competition “Let’s Write Joy in the Place of Sadness,” which was organized by the Kuwaiti Ministry of Media and the Fine Art Workshop for Culture and Arts. Kawthar’s family lived in M’addamiyeh in the Damascus Countryside before moving to Lebanon due to the crisis. Her mother participated actively in teacher-parent meetings at our school, and each evening, the family told stories about Syrian food, evenings, touristic places, artists, and songs; and Kawthar, in her turn, wrote about Syria from what she heard in those evenings. Kawthar did her 2nd and 3rd grades at Jusoor’s school in Jeb Jennine in the Bekaa Valley, after missing 1st grade. She came to school by bus from Kamed Elloz camp, caught up with her missed education year and excelled, and got acquainted with the Lebanese curriculum. She now goes to Lebanese public school. NaTakallam connects Arabic learners worldwide with Syrian refugees (mostly in Lebanon) for language practice over Skype. The platform caters to students in need of affordable and flexible Arabic practice and direct access to native speakers on the one hand, while providing displaced Syrians with a source of income, marketable skills, and an enriching work opportunity on the other. NaTakallam is invited to present its work before the European Council in Strasbourg for its forum on Education and Democracy and was nominated by tech crunch in the category of the Best Humanitarian Tech Start Up. It recently won first place at the Jusoor-supported MIT Enterprise Forum- Pan-Arab Region Competition, as the most innovative education solution that effectively tackles challenges faced by refugees. For more information, visit Natakallam’s website, which includes user feedback and press coverage, notably on PBS, NPR, Mashable, Al Jazeera, the Daily Dot, and France 24. Are you thinking about which organization to donate to at the end of the year, or which one to recommend to a friend? Please consider Jusoor. Donations are tax-deductible in each of the US, UK, and Canada. For more information and to support our programs, click here.